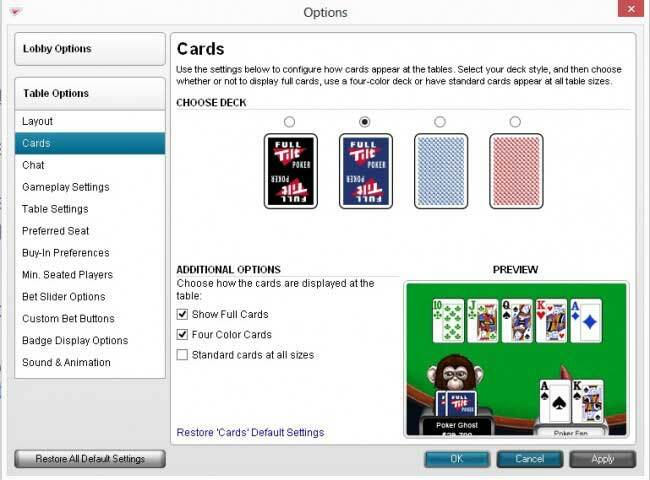 Full Tilt Poker has one of the best software platforms available, and here we will break it down for you. Make sure to use the menu below to jump to the specific section you’re looking for. 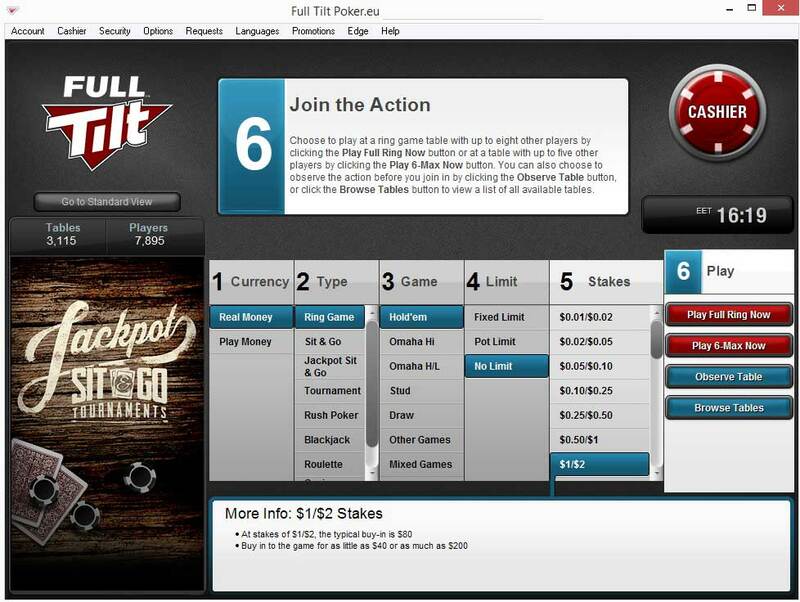 From the early years of taking off in the world of online poker, Full Tilt has always been on the cutting edge of the industry when it comes to software. 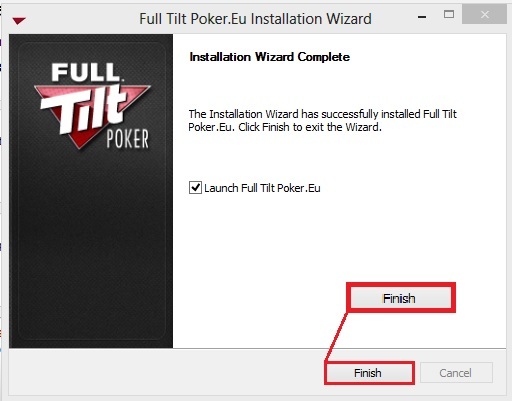 In this guide you will find everything you need to know about downloading, installing and using Full Tilt Pokers’ client. Let’s start with downloading. 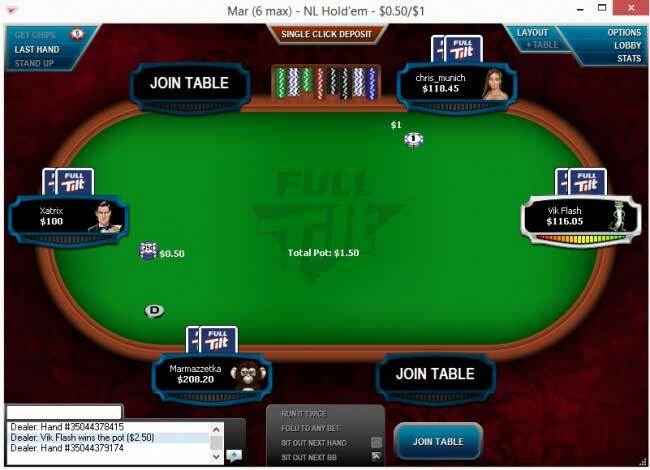 Downloading Full Tilt Poker is a fast and hassle free process. All you have to do is visit FullTilt.com using the links on this page and, once you are there, press the big red Play Now or Download and Play button. Once you click Play now, the download will start automatically and show up in your browser’s download bar. Depending on your internet connection, the download should take between a few seconds and a few minutes, since the file size is almost 50 mb. Once the installer is downloaded, just click on it to launch the installation process. Once you have launched the installer, you must first choose the language in which the installation will continue. Next comes the welcome window, which doesn’t require any input, so just click Next. In the next window, you will see the license agreement. Once you accept the terms of the license agreement, click Next. Unless you want to customize where it’s installed, just hit Next a few more times and that’s it! Now click Finish to close the installer and launch the Full Tilt client. 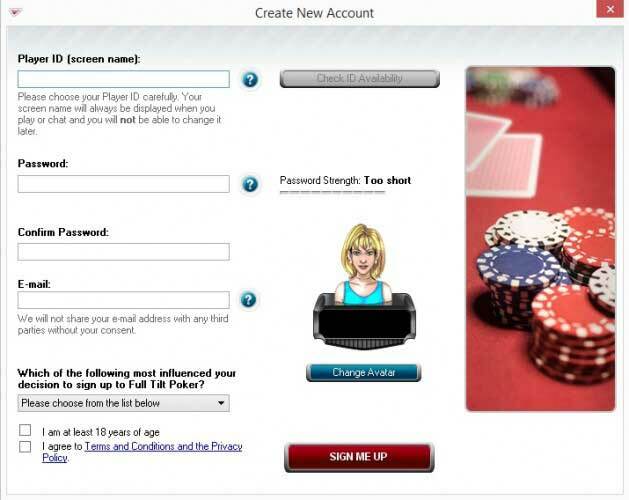 Creating an account at Full Tilt Poker is a very easy and hassle-free procedure. 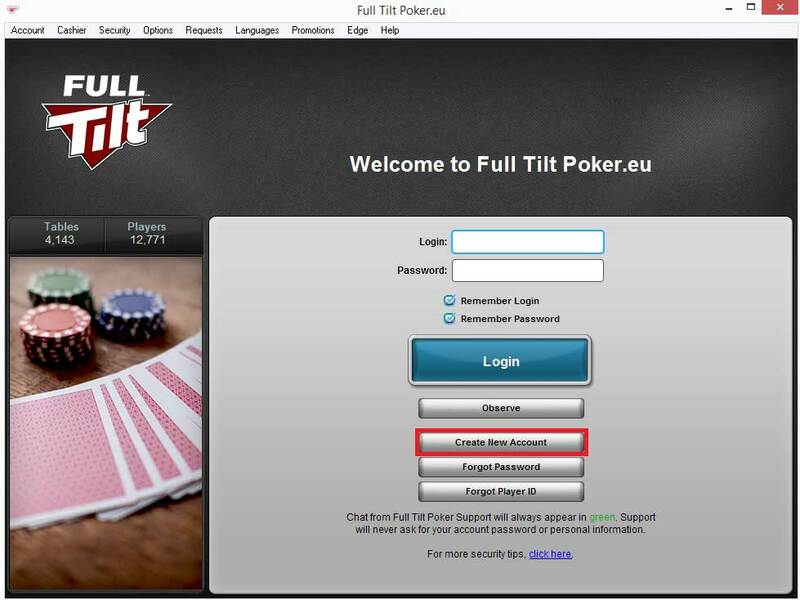 Once you have installed the Full Tilt Poker client and launched it, you will immediately see the login window. Click Create New Account just below the Login button. You will be required to fill out an initial registration form where you will need to enter your preferred screen name, password and e-mail address. At this point you won’t have to enter any personal information like your post code or address. Personal information will be required later upon making a deposit. Once you have finished filling out the form, just click Sign me up. Easy as that! Now all you have to do is validate your account. You should receive your validation code in your e-mail after a few seconds of completing registration, so you can immediately validate it after you complete the registration, or you can do it later by going to the Account menu from the lobby. 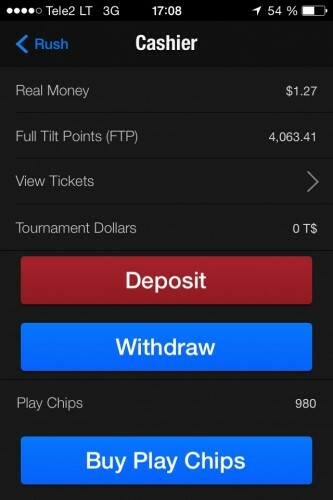 Making a deposit at Full Tilt Poker is very easy. All you have to do is go to the cashier and click Make a Deposit. If you have made a deposit before, you will see the options you have used before first. 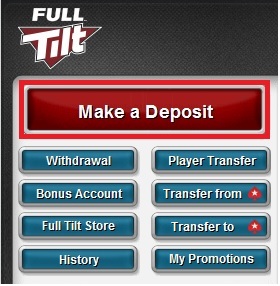 If, however, you haven’t deposited on Full Tilt Poker before or you would like to use another deposit method, just click Add New Deposit Option. You will be transferred to the deposit options page where you will be able to choose any of the deposit options available to you. These options will vary based on your location. Once you choose your preferred deposit method, all you have to do is fill out all the necessary information and your deposit will be processed immediately! Full Tilt has an opening offer of 100% up to $600 for all new players. This can be cleared by playing poker or casino games. To get the bonus, simply make your first deposit and then opt-in via My Promotions in the cashier. For more details on the bonus and clearing details, read our Full Tilt poker bonus page. 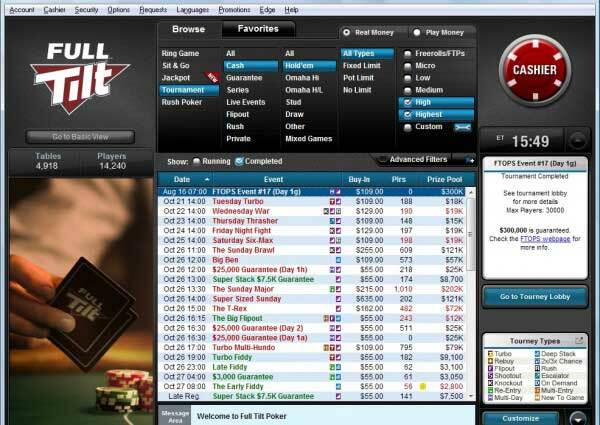 Full Tilt Poker has the best software designers who have spent years perfecting their client. Not surprisingly, many people consider Full Tilt’s software to be the best in the industry. Let’s take a look at some of the perks Full Tilt offers. The lobby is highly functional with three viewing modes. Each mode is designed for a specific purpose though. Standard View presents the most information to the player, with easy-to-use table filters, advanced filters and all the other necessary information clearly displayed around the table list. For the players who don’t wish to browse through the tables, but rather just jump right into a game, the Basic View is available. This view basically cuts out all the additional information about the tables, so all you do is just adjust the filters for the games that you are looking for and start playing at the click of a button! The last option is Mini View, which is simply Standard View’s smaller brother. You can still use all the table filters and advanced filters in Mini View, but the lobby won’t display additional information about the tables. However, with a ~30% decrease in size, the lobby becomes noticeably smaller, which can be helpful you are playing on a laptop with a small screen. 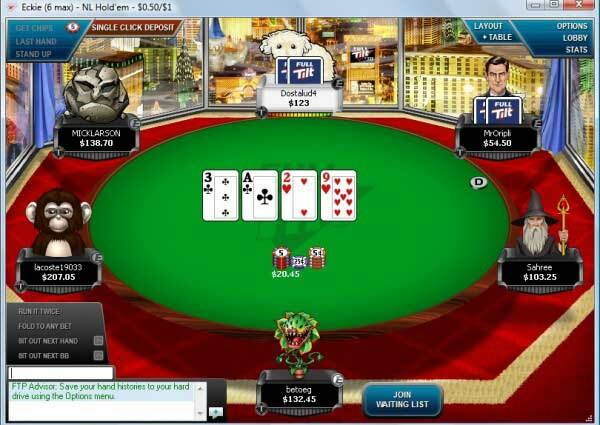 Full Tilt Poker offers one of the widest varieties of games in the industry, including games exclusive to Full Tilt. Apart from the traditional Limit and No Limit Hold’em, Full Tilt has a healthy variety of the second most popular poker game – Omaha. Omaha is very similar to Hold’em with respect to betting and blinds but instead of two cards, you get dealt four, or five, or even six! A total of five variants of Omaha are available: Omaha, Omaha Hi/Lo, 5-Card Omaha, Courchevel and 6-Card Omaha. The traditional Omaha where players get dealt four cards is still the most popular variant with Omaha Hi/Lo coming in second. In Hi/Lo the rules are the same, only the pot is split evenly between the best High and the best Low hands. 5-Card Omaha, Courchevel and 6-Card Omaha are relatively new to Full Tilt, so they have not picked up much steam yet, though you can always find a table with any of these games running. 5-Card Omaha is just what it sounds like, all the same rules, the same action, only with 5 cards per player being dealt. Courchevel is basically just like 5-Card Omaha, with one difference – the first flop card is always revealed when the cards have been dealt. 6-Card Omaha is the newest introduction to Full Tilts’ Omaha selection and no doubt the wildest one. The rules remain the same with each player receiving six cards to play with. With regards to Stud games, Full Tilt offers the standard package of Stud, Stud Hi/Lo and Razz with a classic addition which you might remember from The Cincinnati Kid – 5 Card Stud. The selection of Draw poker games will not disappoint any player with a total of 5 games available, including 5-Card Draw, 2-7 Triple Draw, 2-7 Single Draw, A-5 Triple Draw and Badugi. Most of these games are available in No Limit, Pot Limit and Fixed Limit. Fans of Mixed games won’t be disappointed either, as they have 12 Mixed games to choose from. These include 7-game, 8-game, 9-game, 10-game, HA, HEROS, HO, HOE, HORSE, HOSE, OA and OE. For more information on each separate game visit FullTilt.com. And for the cherry on top of the cake, Full Tilt Poker offers Irish, a variant of Hold’em, in both No Limit and Pot Limit formats. Now you can play your favorite casino at Full Tilt Poker from the comfort of your own home! Full Tilt Poker offers games starting from $0.10 a bet up to high roller stakes and you can play at both single player and multi player tables. 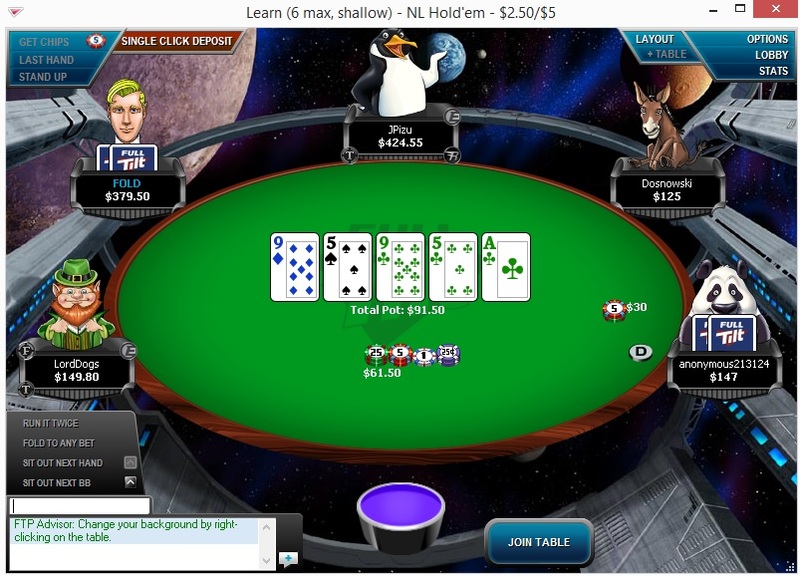 Players are limited to a maximum of four tables which are independent of poker table limits. Casino game are currently not supported in the MAC version the software. You may sit out at a casino games table for up to 15 minutes, after which you will be removed from the table. With four different types of blackjack, Full Tilt Poker is one of the leading providers of online blackjack. You can play more than one hand per table, but each hand must have at least the minimum bet. 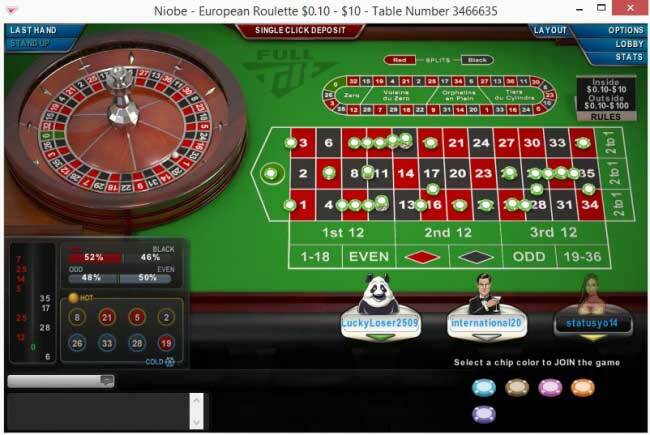 Along with blackjack, try out the European-style roulette tables with stake levels that suit every bankroll and are also available in both single player and multi player format. All of the casino games are also available at play-money tables, which you can sit at without making a deposit and try out these great games! 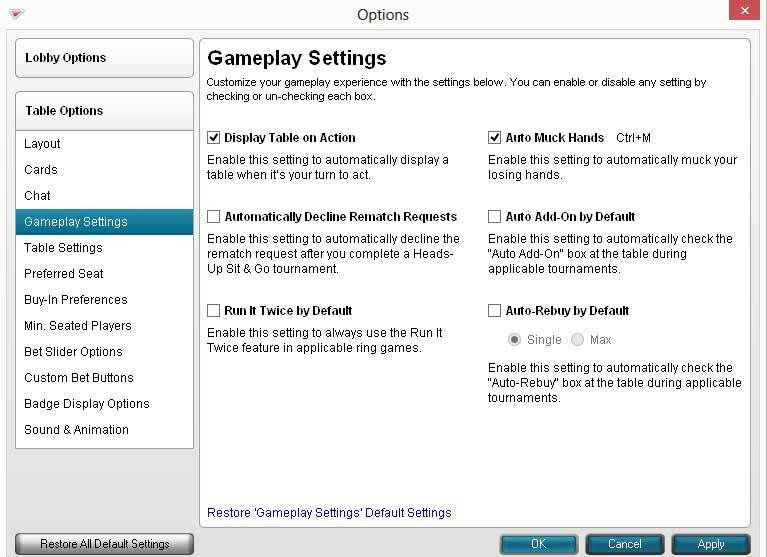 Most of the available setting for the lobby and tables can be found in a single place, the preferences menu. In the Lobby Settings menu you will find a lot of useful things that you might need. Always join individual waiting list allows you to join waiting lists for individual tables, rather than waiting for the first available spot at your preferred tables. Bring Lobby to Front brings the lobby to front whenever a ring game or a tournament closes. 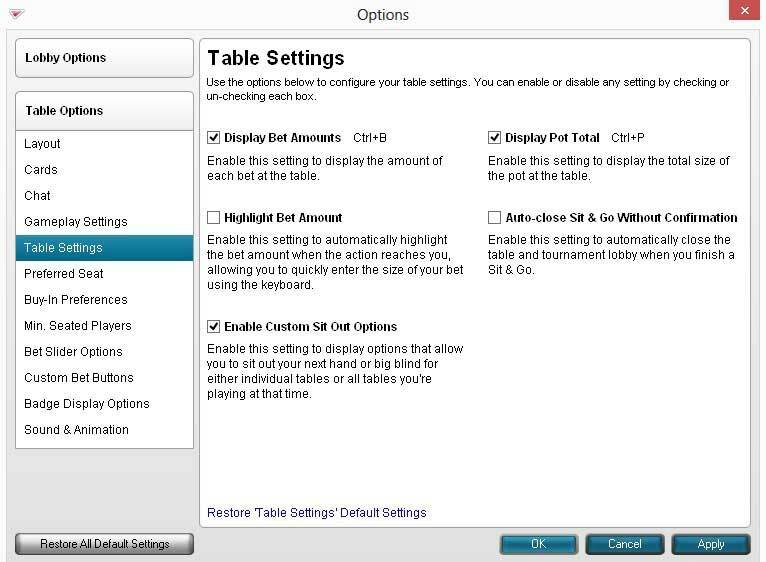 This is a good feature if you are playing one or two tables, but if you are playing more than that and switching table often, the lobby popping up every time might get annoying. Show Tournament Announcements will let you receive announcements about upcoming tournaments in the player chat. This can be quite useful for when you forget to register for a tournament that you were about to play. Show New to The Game option allows you to view the New to the game tables which recently launched on Full Tilt Poker. Auto-Open Tournament Lobbies will open a tournament lobby automatically whenever a tournament begins. Just like with Bring Lobby to Front, this is useful if you are not playing a lot of tables, at which points it simply gets in the way. Hide Me from Find Player allows you to opt-out of the player search feature available on Full Tilt. This means that other players won’t be able to find all the ring games and tournaments that you are playing, but it also means that your friends won’t be able to do that either. Disable Exit Screen turns off the promo screen that appears for a few seconds whenever you close the Full Tilt client. It might be best to leave this feature on since the screen disappears pretty quickly and there is always a chance that it will show you a promotion that you have overlooked before. Hide Casino Game Navigation hides casino games from the main search filter, so that it shows only poker games. The lobby itself still has a few tricks that might be useful for any player. 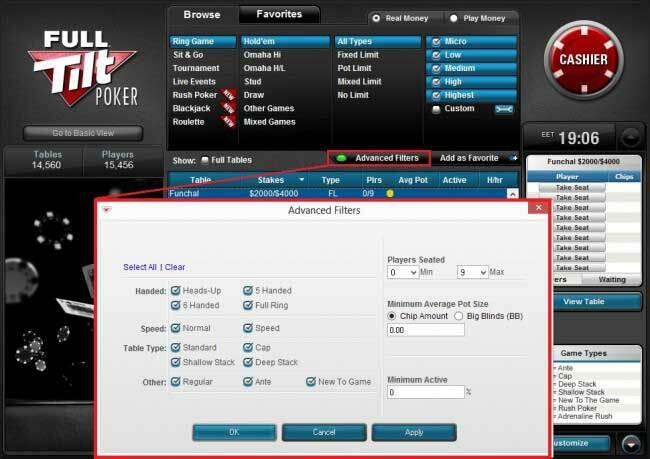 For example, if you are new to Full Tilt Poker, you have the option to play at the New to the Game ring games or tournaments. These tables are only visible in the standard and mini lobby views. If you like a particular game and don’t care for other games, then you should take advantage of the favorites feature. You can add any filter settings to your favorites so you can quickly find your favorite games every time you log on. Advanced table filters allow you to sort out tables by the table type, speed, maximum buy-in amount and other settings. When you are looking for a specific table to suit your needs, this is an excellent feature for the job. To access the cashier, just click the big red Cashier button in the lobby. To make a deposit, just click Make a Deposit at the top of the cashier screen. For further instructions on depositing, refer to our previous deposit section. 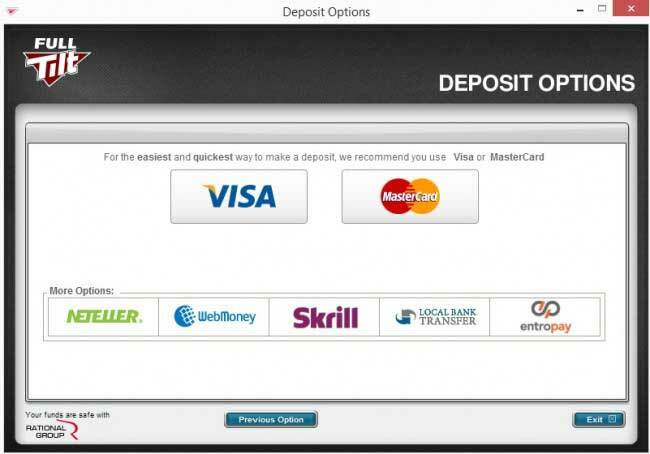 To make a withdrawal, click Withdrawal just below the deposit button. To make a withdrawal you must first deposit at Full Tilt Poker at least once. You cannot make withdrawals to e-wallets or cards that you have not used for depositing before. To access the Full Tilt Store, click Full Tilt Store below the withdrawal button. There you can spend your accumulated Full Tilt points on tournament and ring game tickets, cash, merchandise and much more. Just below the Full Tilt Store button, click History to access the status of any of your pending transactions or the complete history of your prior transactions. 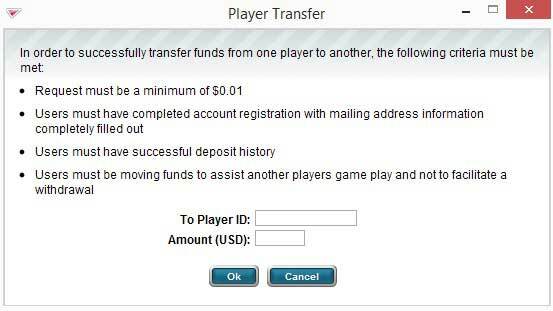 If you wish to transfer funds to another player, click Player Transfer just below the deposit button. To transfer funds to other players you must first make at least one successful deposit. Be sure to enter the username of the other player correctly. Full Tilt Poker allows direct transfers to PokerStars for players who have directly linked their accounts. 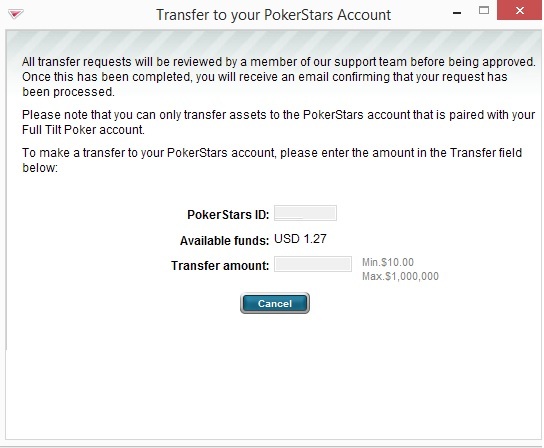 To transfer funds to your PokerStars account, just click Transfer to PokerStars and fill in all the necessary information. If you want to check out your promotional offers, click My Promotions. This will transfer you to the Full Tilt Poker website where you can find all the necessary about general promotions that are currently running, as well as private promotions just for you. 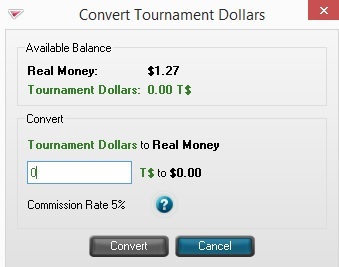 If you won Tournament Dollars in a satellite and would like to cash them in for money that you can use in any games, just click Convert t$ just below your total balance. All your Tournament Dollars will be redeemed at a price of 95% for every dollar. You can check out your ticket balance by clicking View Tickets just below the Tournament Dollar conversion button. Tickets can be bought in the Full Tilt store or directly by registering for the Steps tournaments. If you need to reload your play chips, just click Reload Play Chips below the View Tickets button. You can reload 1000 chips once every 5 minutes. Rational Group, the company that also owns PokerStars, operates full Tilt Poker. Over the years, PokerStars has maintained a spotless reputation with regards to software security and now, Full Tilt Poker bring you the same security. 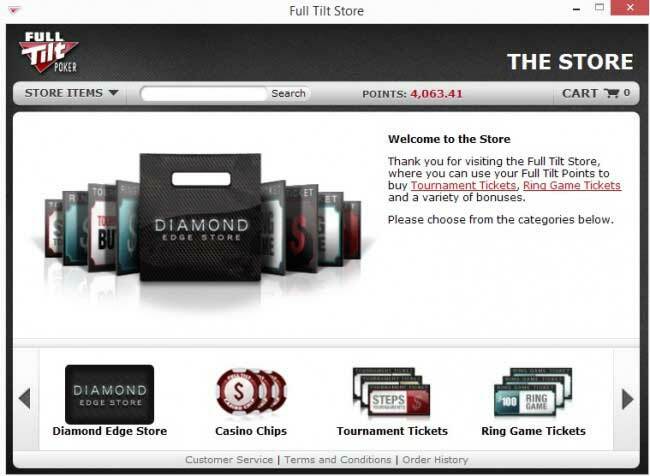 Full Tilt Poker uses 128-bit SSL encryption to protect sensitive user information. The servers, which store this type of information, are also stored inside a locked cage. Since the re-launch of Full Tilt there have been no security issues up to date. 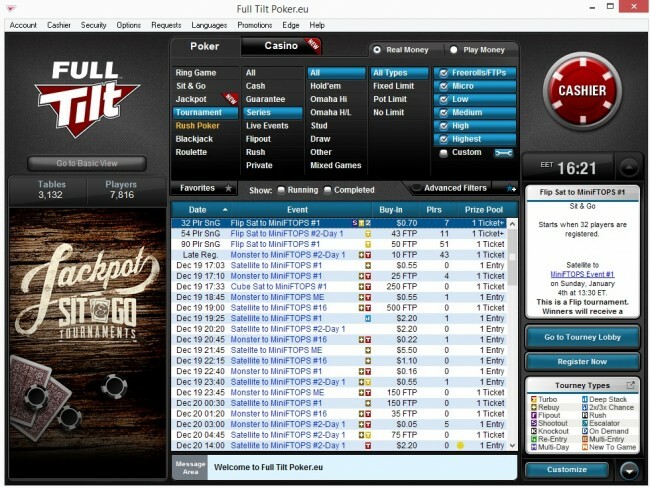 Full Tilt Pokers’ software has been designed to operate on nearly all computer systems. However, Full Tilt does not have a native linux client. You can still play on linux by emulating a windows environment using WINE. Windows XP, 266 MHz CPU, 64 MB of RAM, screen resolution of at least 800×600 with minimum of 256 colors, dial up connection (56.6), and 30 MB of free disk space. Mac OS X 10.5 or higher Intel based Macintosh, 512 MB of RAM, dial up connection (56.6), and 30 MB of free disk space. 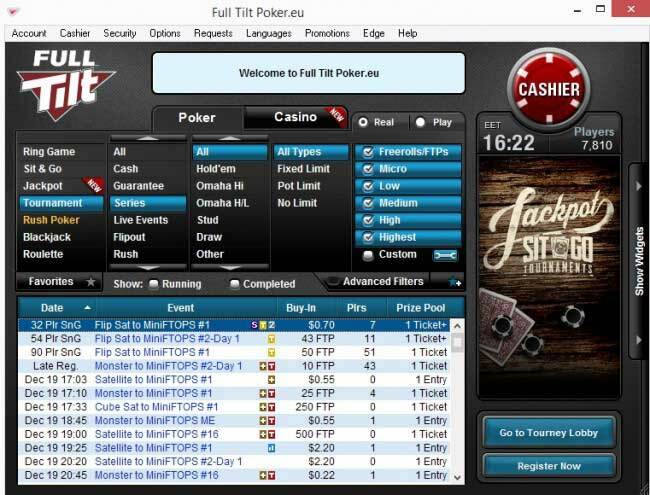 The Full Tilt Poker installer and client are available in a total of 23 languages: English, български, Čeština, Dansk, Deutsch, Español, ελληνικά, Français, Hrvatski, Italiano, Magyar, Nederlands, Norsk, Polski, Português, Pу́сский, Română, Slovenčina, Suomi, Svenska, Yкраїнська мова, 中文 (简体), 中文 (繁體). Try the Full Tilt Software Now! In the preferences menu, just below Lobby Options you can select the Table Options menu, which contains all sorts of widgets to customize the table exactly how you need it. To begin with, you can choose two table views, the Classic view and the Racetrack view. In the Layout menu you can also select whether to display other players avatars. You can choose how the cards are going to be displayed. Four deck styles are available and you can also choose how the cards are going to be displayed and whether or not to use a four color deck. In the Chat menu, you can choose who can receive chat messages from. You can turn off messages from observers and players separately and chose the amount of dealer messages that come in throughout the hand. 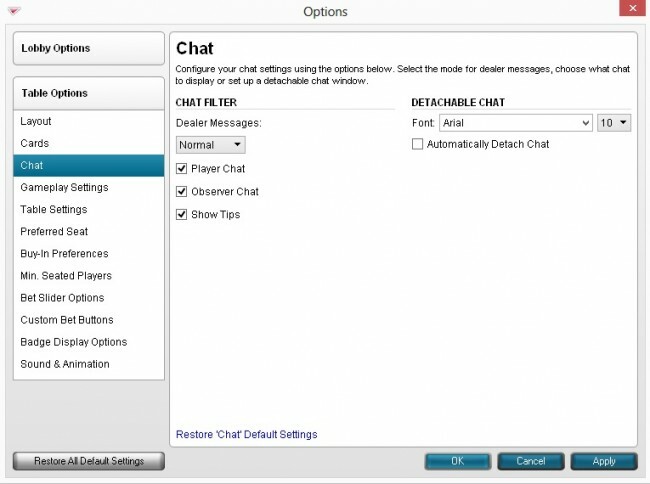 If you are actively chatting with someone else, it’s best to keep the Dealer messages setting on normal or silent, since selecting Everything will clog up the chat box in a hurry. You can also select whether to automatically detach chats from your tables. Detached chats take up quite a lot of screen space, so this option is good if you play only a few tables at a time. Gameplay Settings offer some neat things to make you gaming experience even better. Display Table on Action bring the table to focus every time an action is required. This is very helpful is you have stuff going on besides poker and the screen is clogged. With this feature enable, the tables will simply pop up to the front of the screen. Automatically Decline Rematch Requests let’s you turn down all rematch request in heads-up sit & go’s. Run It Twice by Default allows you to run it twice any time that is allowed on a table and if your opponent has the same feature enabled. For more information on running it twice, check out: Running it Twice: The Ultimate Guide. Auto Muck Hands – with this feature enabled, all your loosing hands will automatically be mucked. This, of course, only applies to situations where you are the last player to show your hand at showdown. Auto Add-On by Default – with this feature you don’t have to worry about forgetting your add-on in a tournament ever again. Auto-Rebuy by Default – this feature allows you to automatically rebuy in tournaments whenever your stack falls below the starting amount. Display Bet Amounts, when enabled, will display the bet amount of all bets made on the table. This feature should be enabled at all times, since it will help to avoid a lot of possible mistakes with bet amounts. Highlight Bet Amount brings focus to your bet amount box. This allows you to enter a bet amount with your keyboard without having to manually click on the box prior to that. 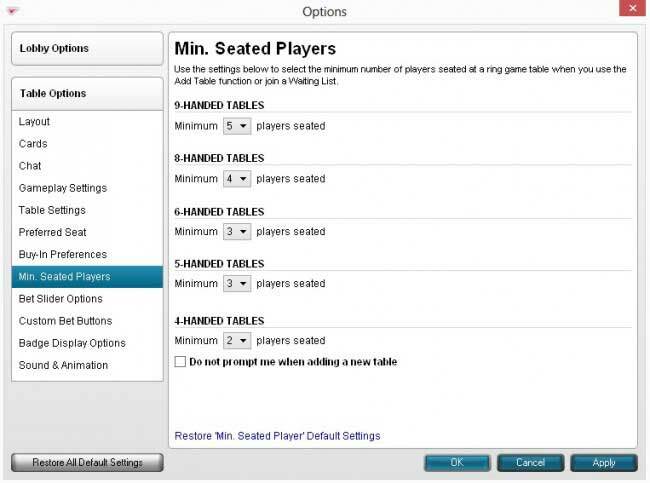 Enable Custom Sit Out Options add two additional sit out options to your tables. With this feature enabled, you can choose to sit out of the game starting with the next hand or once the big blind reaches you. Display Pot Total – displays the total size of the pot, which is a very helpful feature. Otherwise, you would have to hover your cursor over the pot every time you wanted to see the exact pot size. Auto-close Sit & Go Without Confirmation – when enabled, this feature will automatically close the sit & go table and lobby upon completion. With preferred seating you can choose your preferred seat for any table type for both the Classic and Racetrack table views. Alternatively, you can enable the Auto Center feature, which will sit you in the center of every table. 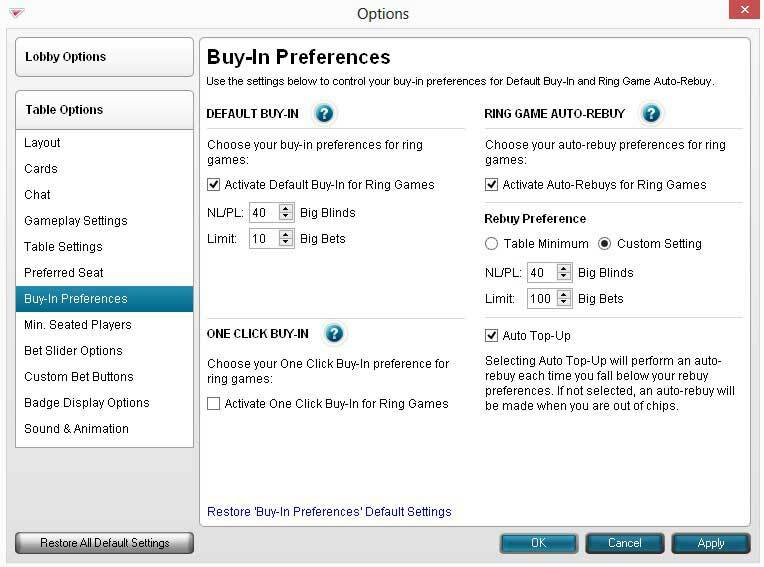 In the Buy-In Preferences menu you can set up you preferences for virtually any situation in a ring game. You can set your default buy-in amount for No limit and limit games, so you don’t have to do it manually each time you sit at a table. You can also set an auto-rebuy feature that will automatically rebuy in a ring game when your stack falls below a set amount. The Min. Seated Players feature applies to the Add Table feature in the lobby. Add Table lets you automatically join a waiting list for selected tables, and the Min. 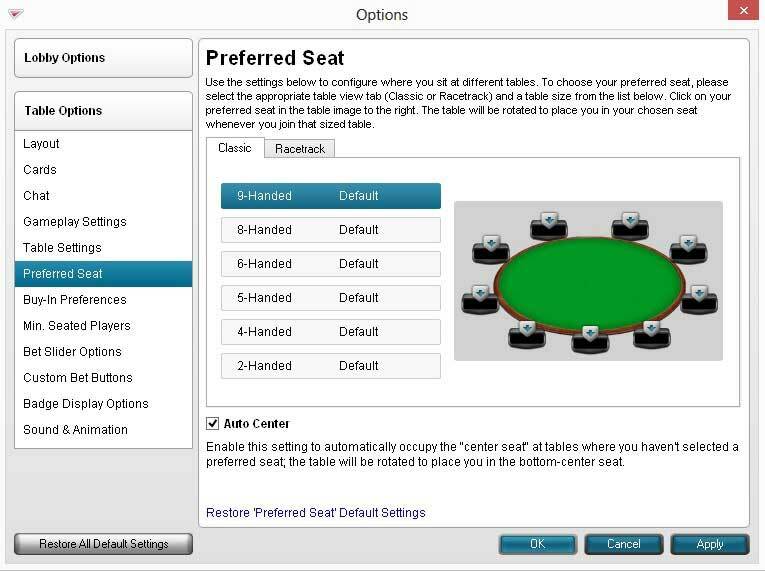 Seated Players feature lets you choose the minimum amount of players each table type should have to qualify for the waiting list. 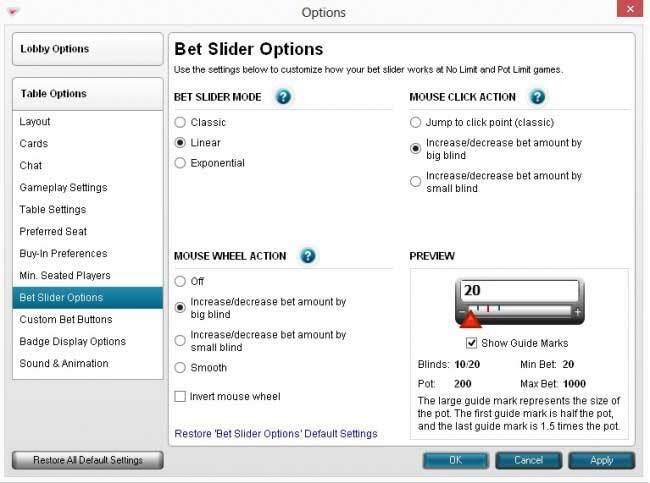 Bet Slider Options allow you to customize your slider for much greater efficiency. First of all, you can choose the bet slider mode where you have three options: Classic (The size of the pot is the midway point of the slider), Linear (The midway point of the slider represents half of your stack) and Exponential (The bet amounts on the slider increase exponentially). You can also enable the mouse wheel to control the bet slider, with one scroll of the wheel being equal to one big blind or one small blind. Custom bet buttons allow you to change the default Min, Pot and Max buttons above the bet slider to ones of your choosing. The buttons can be changed separately for No limit and limit games as well as for pre-flop and post-flop action. 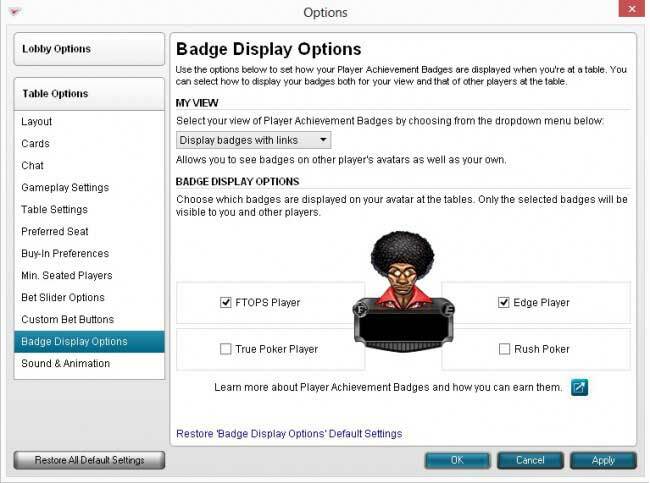 Badge Display Options allow you to customize the way your badges will be presented to other players. Sound and Animation allows you to configure the amount of sound notifications and animations at the tables. Sounds can be completely turned off, set to Alerts Only or fully turned on. Animations can also be turned off completely, reduced or fully enabled for regular tables. 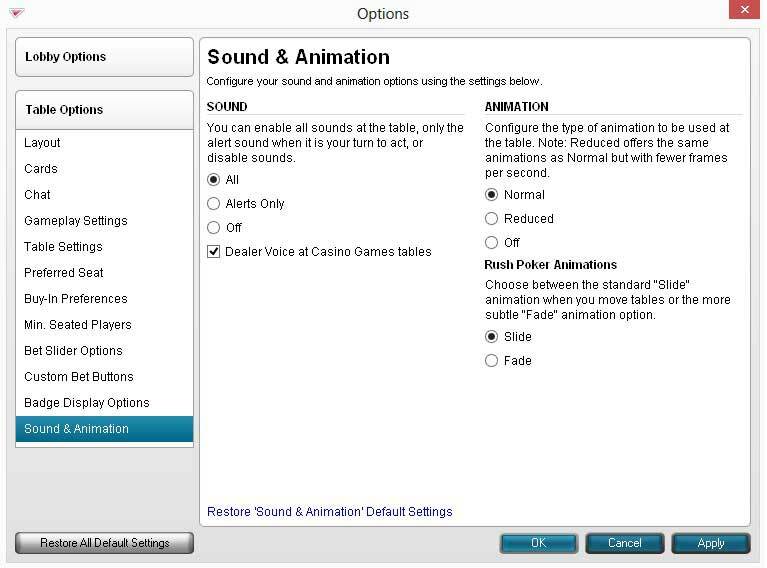 For Rush Poker table moves you can choose slide or fade to select your preferred animation during table transition. Along with all the great games on offer, Full Tilt Poker also brings you Rush Poker, the fast paced game filled with action! 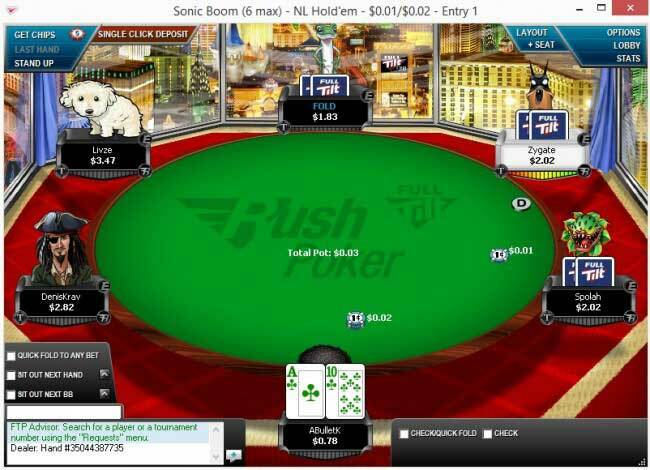 This poker format is designed to minimize waiting time between hands, so when you are playing a Rush Poker ring game or tournament, you’ll join a large player pool and face a different table of opponents every hand you play. Once you fold your hand, you’ll be moved to a new table with new players and a new hand immediately. Compared to a standard ring game, playing Rush Poker will equate to almost four times more hands per hour and you can also combine your favorite tournaments with the excitement of Rush Poker. Rush Poker Tournaments are available in a variety of formats, including freeze-out, rebuy, turbo and knockout tournaments. All Rush tournaments are marked in the lobby with the letter R besides them. Adrenaline Rush is an even faster variant of Rush Poker and it available only at Full Tilt Poker. Adrenaline Rush games are 4-handed and you can buy in for between 5 and 10 Big Blinds. There is no post-flop betting. You can only raise or fold pre-flop, except when your opponent is all-in and the betting cap has been reached or you are facing a raise greater than your stack size. You can find Adrenaline Rush games right next to the regular Rush Poker games. 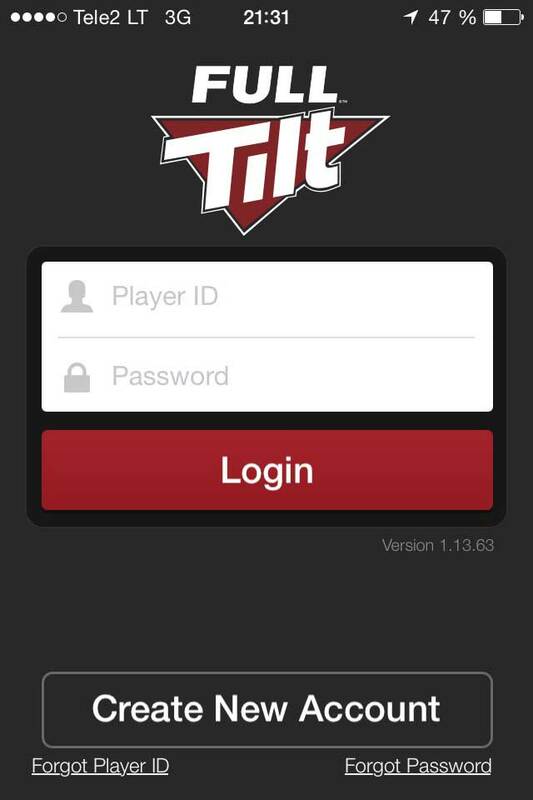 Full Tilt mobile app is available for both Android and iOS platforms. Android devices require at least Android 2.3 or above and a minimum screen resolution of 800×480 to run the app. The app will work on, but not limited to Samsung Galaxy, Galaxy Nexus, Motorola Droid RAZR, HTC Sensation, HTC Desire, Sony Ericsson Xperia X10, Sony Ericsson Xperia X13 and Acer Liquid A1. You can download the Full Tilt Poker app for Android by visiting www.fulltilt.com on your mobile device. 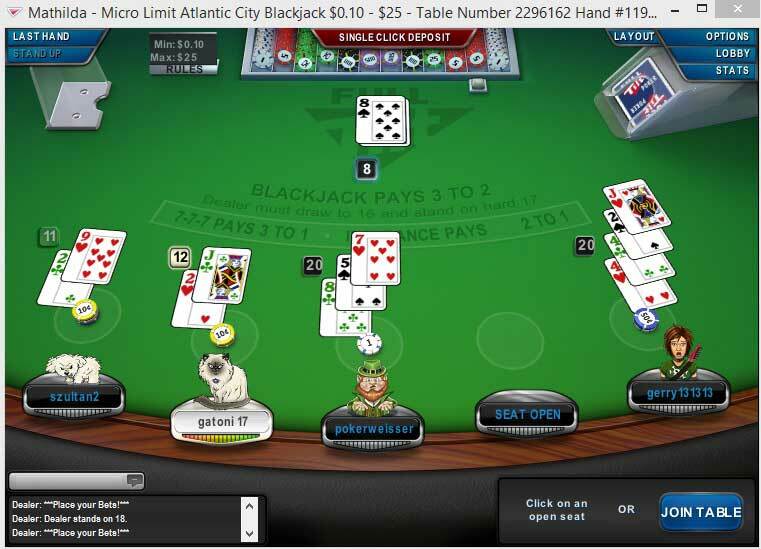 The Full Tilt Poker app is also available for iPhone, iPad and iPod touch and you can download it directly from the App Store. The Full Tilt Poker app requires iOS 5.0 or higher to use and can be used on the following devices: iPhone 3GS, iPhone 4, iPad, iPad 2, iPad mini, iPod touch 4th generation and iPhone 5. The Full Tilt Poker app offers Rush Poker, Adrenaline Rush and cash games. Players can choose from No Limit Hold’em or Omaha Hi. The app is available in the following languages: English, German, Spanish, Russian, Portuguese, French, Dutch, Swedish, Finnish and Norwegian. 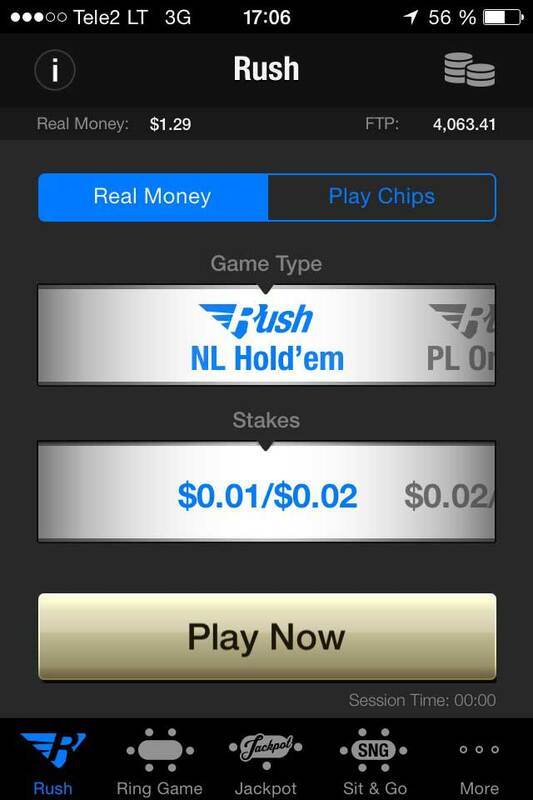 All the games that are available on the Full Tilt Rush Poker app are the same as those available on the computer based software, so you will be playing with the same pool of players as those using their computer. 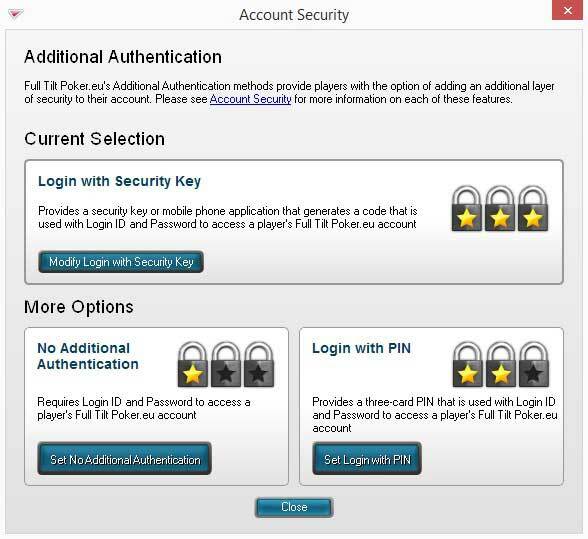 You can log in using your existing user ID and password, or if you don’t have an account with Full Tilt Poker, you can create one right in the app! You can play No Limit Hold’em or Pot Limit Omaha for real money or play money, including the latest addition to Full Tilt Poker – Adrenaline Rush. 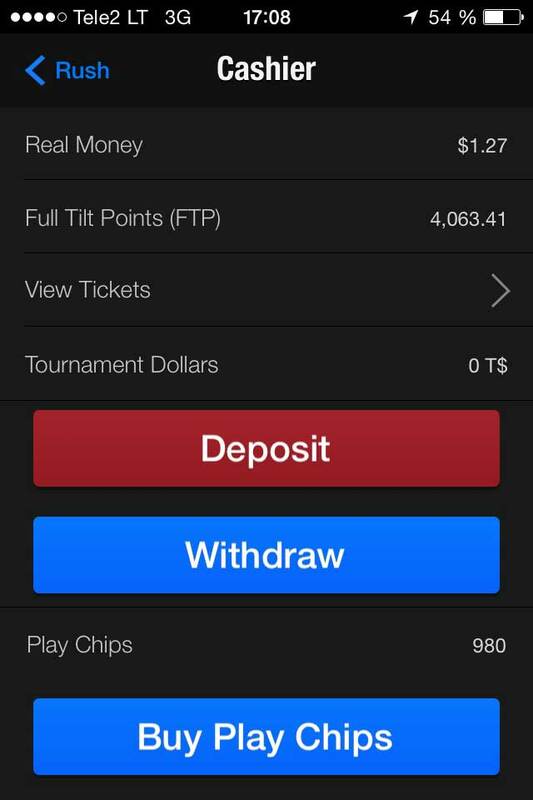 The Full Tilt Poker app allows you to make real money deposits and withdrawals quickly and easily on your mobile device. There are countless features and details within the Full Tilt client, and here are a few more that don’t really fit in anywhere else. 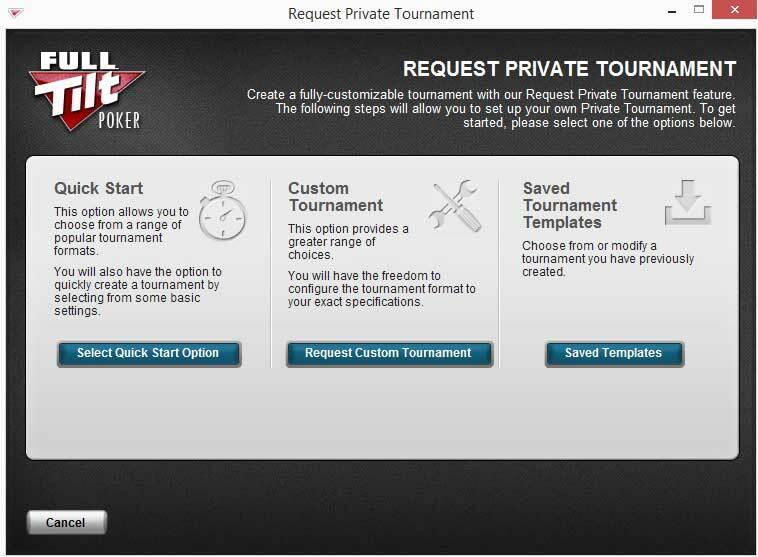 Full Tilt Poker allows you to instantly create your own tournaments, where you get to decide everything about the tournament! All you have to do to create your own tournament is earn at least 100 Full Tilt points. Let’s take a look Full Tilt’s private tournament features. 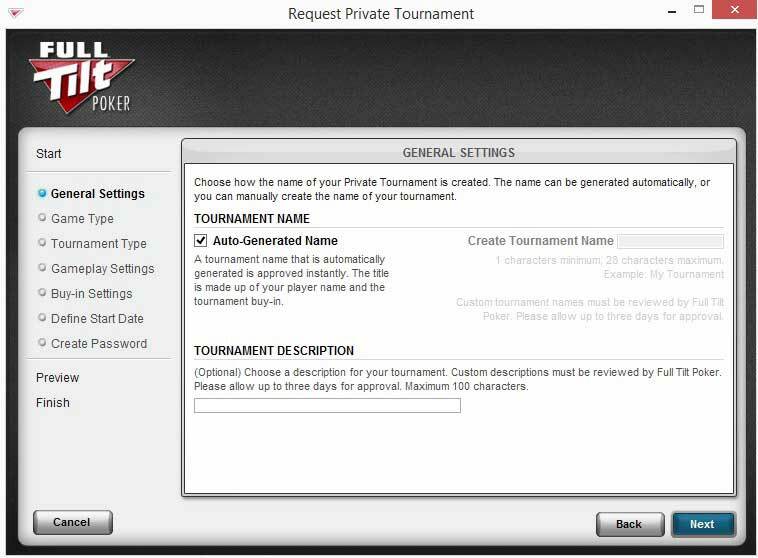 To request a private tournament, go to the Requests menu and click on Request Private Tournament. To set up your private tournament quickly by selecting one of the popular tournament templates, just click Select Quick Start Option. This way you will be able to select one of the templates for the tournament setting and won’t have to select each setting manually. If you want more detailed settings for the tournament, click Request Custom Tournament. Let’s take a look at the settings menu for private tournaments. Firstly, you can choose a custom name for your tournament or just auto-generate one. If you choose a custom name, your tournament request will need up to 72 hours for approval, otherwise it will appear immediately in the game lobby. There are many options you can customize, such as the game type and limit, tournament structure, (you can choose Shootout, Rebuy, Knockout, Cashout and Rush tournament), players per table, starting stack, buy-in, etc. Just follow the directions, choose your options, and keep pressing Next. Finally you need to set the date and time for the start of the tournament, but remember that tournaments can only be created up to three months in advance and the earliest your tournament can begin is four hours from the time it is created. Lastly, you need to add a password to your tournament which has to be between 6 and 15 characters. If you have any questions regarding private tournament, contact supports at privatetournaments@fulltilt.com. To customize your widgets in Full Tilt lobby, you have to switch to Standard View and click the Customize button at the bottom right of the lobby. You can use the Customize Lobby Widgets window to turn on or off any of the widgets that are available, as well as modifying some of them. Let’s take a look at some of the individual widgets available. The Edge Status Lobby Widget provides information about your status in the Edge Rewards program. It can be used to track rolling Full Tilt Points averages and points remaining until a higher Edge status level is obtained. The Edge Reward Counter Lobby Widget allows you to track your Edge Reward cash payment increases. The Sit & Go Player List Widget is only available for single-table Sit & Go tournament selections and can be used to see the names and stack sizes of the players in the Sit & Go. The Next Tournament Countdown Widget shows you all the upcoming tournaments in which you are registered. It can also show how many Sit & Go’s you are registered for. The Player Search widget allows you to find players quickly without having to go to the Requests menu all the time. The Rush Poker Info Window provides details about the selected Rush Poker game. You can view the total number of players, total available seats, total hands per hour and average hands per hour. The Go to Rush Poker Lobby button opens the Rush Poker lobby and The Join Now button takes you straight to a Rush Poker table. 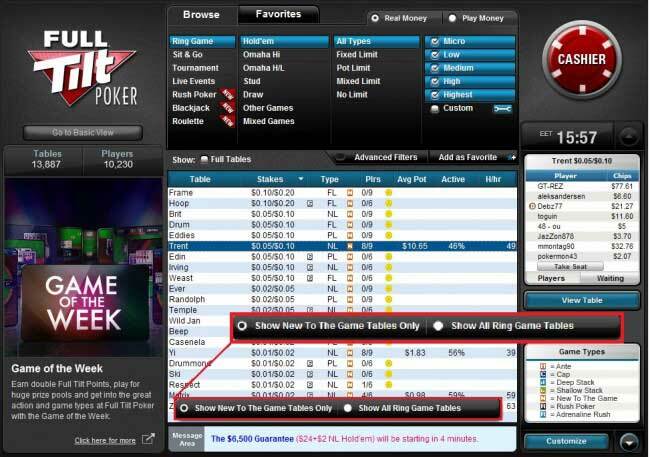 The Join Waiting List and View Table Buttons Widget provides information about any ring game at Full Tilt Poker, so you can instantly join a waiting list or observe a table. The Go To Tourney Lobby and Register Now Buttons let you quickly browse the lobby of any Sit & Go tournament as well as quickly register for any of them. The Player List Window for Ring Games provides information about the players currently sitting at the selected ring game. You can also take a seat at that table if it is available. The Tournament Info Window provides information about the selected tournament. The Tournament Types Icon Legend provides information about the type of the selected Sit & Go or tournament. The icons in the Tournament Types Icon Legend correspond to the icons that appear in the Game and Type columns of the game list. The Ring Game Type Icon Legend provides information about your selected ring game and works the same as the Tournament Types Icon Legend. The Mini-Cashier allows you to keep your Cashier information always in sight. 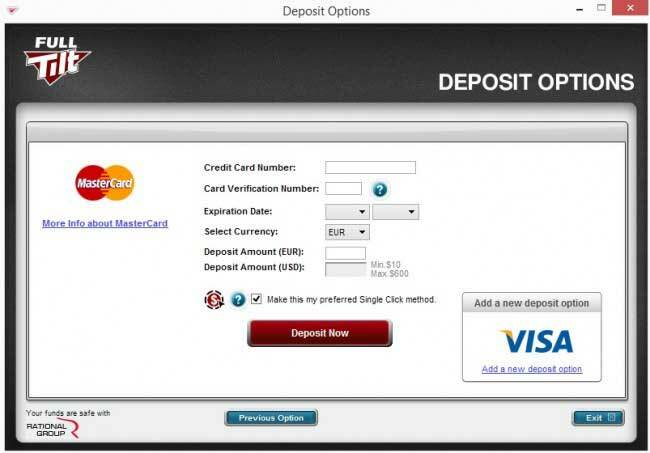 You will always see the total amount of money available, the amount in play, and an easy access to the deposit button. The FTP Odometer Widget is a great tool for keeping track of earning Full Tilt Points. You can track your base Full Tilt Points, bonus points and total points. To begin counting your points from zero, just click Reset. The Session Information Widget provides information about your current session. You can quickly see your account balance, Full Tilt Points earned and number of hands you’ve played during the session. Full Tilt Poker maintains the most cutting edge security measures to ensure that every player’s personal information is protected. Two additional methods of authentication are available to all players, Login with PIN and Login with Security Key. Both PIN and Security Key work in conjunction with your used ID and password. They add additional layers of security, requiring the user to enter additional verification codes each time they log in. If you choose the additional PIN security layer, you will be provided with a Personal Identification Number (PIN) that will be used in addition to your user ID and password. In this PIN, random playing cards will represent each number. To setup account protection, open the Security menu and select Additional Security Settings. This will open the security settings page where a step-by-step activation process will help you set up PIN protection for your account. You can also set up additional verification using the security key. A security key is a piece of hardware that produces a six-digit code that changes automatically every 30 seconds. This code is used in addition to your user ID and password to access your account. You will first need to order the security key from Full Tilt Store before you can start using it. Once you have received your security key, just follow the same steps described in the PIN protection activation process above to set up security key protection. As you can see, the Full Tilt Poker software is complex and very open to customization. It is one the best online poker software out there, allowing players to adjust the settings to match their liking. We highly recommend Full Tilt Poker, both for the software and promotions. There isn’t anything better out there for beginners or grinders. Try it out now!